The Manawatu Estuary has transformed significantly over the last century or more. In the 1800s, the mouth of the Manawatu River reached the sea several kilometres north of where it flows into the sea today. With the arrival of Europeans in the latter half of the 19th century, and the foundation of the town of Foxton, it soon became a bustling port. However, with the strong southward current depositing much sand on the coast a spit has gradually grown and the mouth of the river has slowly moved southwards. Today, it is used by recreational boaties but has long since lost any commercial significance as a port. However, perhaps the biggest transformation has not occurred in the estuary itself, but the human perception of it. Once its significance as a port was lost, and the Foxton end of the river became increasingly degraded by siltation and pollution [see also: The town that lost its river: the sad story of Piriharakeke], the river mouth was seen largely as a useless and unattractive wasteland of tidal flats, “useful” only for white-baiting and for off-road vehicle “hooning”. But an evolution in this place’s significance took place in the 1980s and 1990s; the term “estuary” itself signifies such a transformation – in the understanding of the natural function and ecological significance of the river mouth and the tidal flats. In 2005, after prolonged representations by the self-appointed guardians of the estuary, the Manawatu Estuary Trust, the Manawatu Estuary was designated as New Zealand’s sixth Wetland of International Importance, under the RAMSAR convention, an inter-government treaty on the conservation of wetlands. It is now recognised that the estuary has one of the most diverse ranges of birds to be seen at any one place in New Zealand, a total of 93 species have been identified at the estuary. It is a significant area of salt marsh and mudflat and an important feeding ground for many birds, including the migratory eastern bar-tailed godwit, which flies non-stop for 11,000 kms from Siberia to escape the harsh northern winter. The estuary is also a permanent home to 13 species of birds, six species of fish and four plants species, all of which are threatened. It regularly supports about one per cent of the world population of wrybills. Off-road vehicles still pose potential threats to the estuary habitats and inhabitant species, but there has been substantial progress, through patrolling and awareness-raising, towards curbing the use of these vehicles. Photo top: the Manawatu Estuary, courtesy Nature Coast. 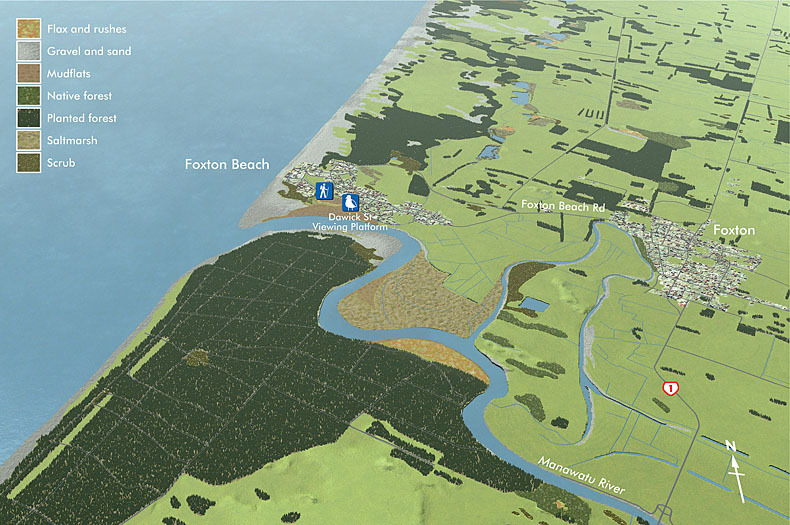 Map of Estuary, courtesy Horizons Regional Council. Above: photo of the Estuary from the air, courtesy Plan my Play. Previous Article Could blackberry jam have become NZ’s biggest export? Great that it has RAMSAR status. Thank you for letting us know, Mik – I will rectify. Can you recommend a good replacement photo? (They are a bit hard to come by).